Located in Rutkowski Park, follow the bike path to the corner by the big rocks. Come see the winter birds eating seed. 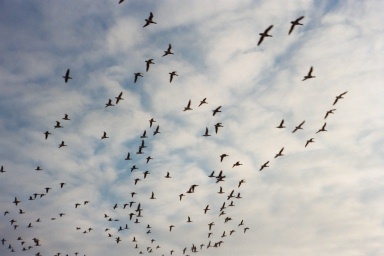 How many of the birds and ducks below can you name? 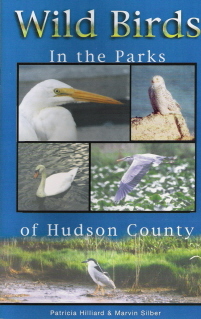 Wild Birds in the Parks of Hudson County was written by Patricia Hilliard with photos by Marvin Silber. 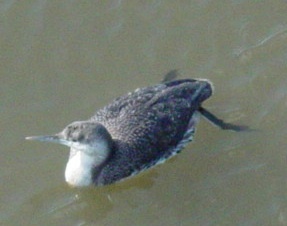 Patricia Hilliard will join you on the bird walks sponsored by the Bayonne Nature Club. For your free download of this book click on the "e-book" above. South Cove Commons - Lefante Walkway: This walkway takes you out toward Robbins Reef. 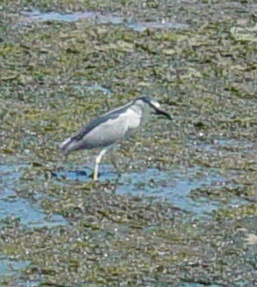 In summer during low tide you will see sandpipers and plovers. Golden Plovers were seen here in 2008. Osprey frequently fly overhead in September. Rutkowski Park - Great for viewing Egrets and Herons, Belted Kingfishers, Red-winged Blackbirds and Marsh Wrens. Stephen Gregg Hudson County Park - Wood Warblers can be found in the trees on the bank between the ball fields and the upper forest area, especially near the pond. The upper forest has Red-bellied Woodpeckers all year round and Baltimore Orioles in summer. 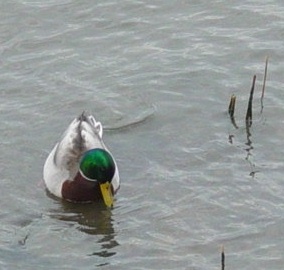 Far Right: Male Mallard in breeding colors. See answers at bottom of page.. Thanks to Sadie and Katelyn for this beginner bird guide! BIRD TIP: If you can't afford bird seed, remember you can put out fresh water for the birds. They need it because summer is hot. Winter is dry and most sources of water are frozen. Refresh the water daily to provide a clean drink. In winter refresh as often as possible because water will freeze within 30 minutes on very cold days. 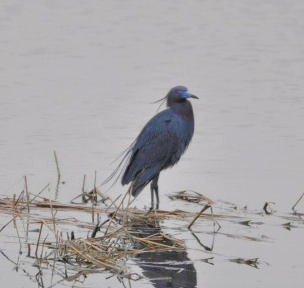 Bird at left: Little Blue Heron, seen in Bayonne NJ. Photographer: Ed Rumain This is a RARE bird. It is not frequently seen in our area, but it is not endangered. ENDANGERED birds are those whose habitat has been destroyed. They may not survive. It is important to protect habitat. 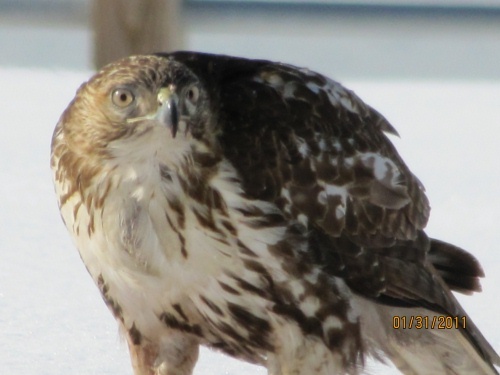 At left is a picture of a Red-tailed Hawk, seen in Bayonne Park (S. Gregg - 2/11/2011), photographed by Susan Hill. 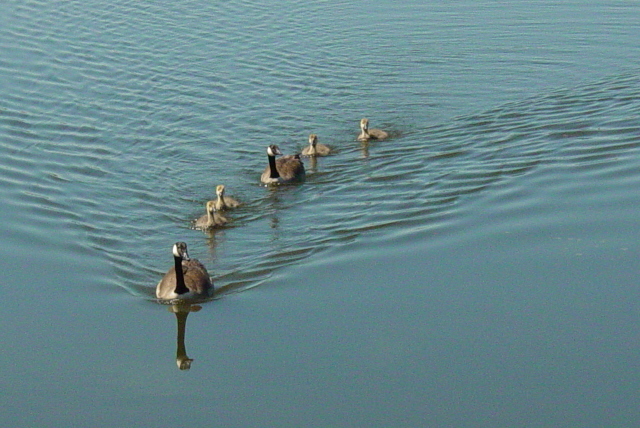 The larger duck is not the parent of the smaller one. These are two different types of ducks or "species." 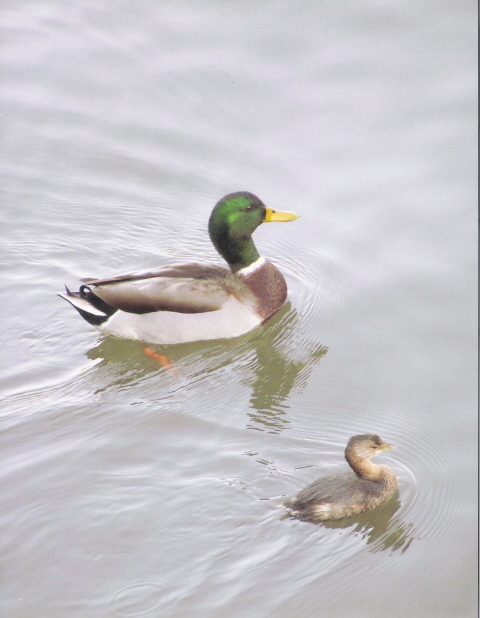 The top one is a male Mallard, the bottom one is a Pied-billed Grebe. 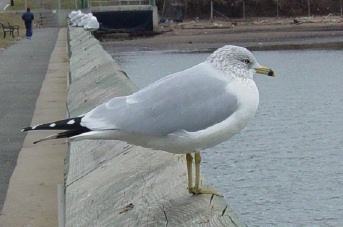 You can learn more about birds when you go on a bird walk with the Bayonne Nature Club. The picture at the right was taken by Marion Cooney. For Bird Photographers: Here's a free book about digital bird photography. Secrets of Digital Bird Photography by Bill Majoros. Tells you everything about digital cameras, lenses, computers, monitors, birding locations, composition of bird photos, techniques for taking better photos etc. The book is entirely online and easy to use. 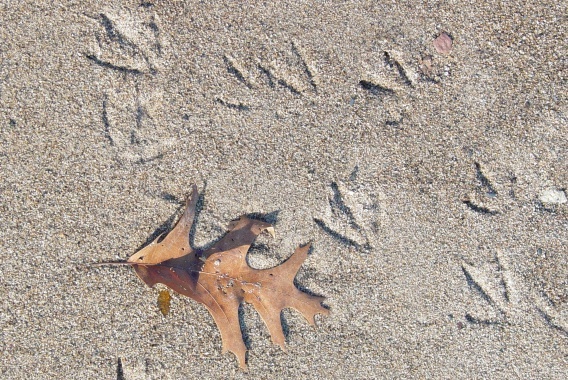 Our schedule of BIRD WALKS is on our HOME PAGE. Click on the button above. You can discuss birds with us on Facebook. Click here for our WILDFLOWER PAGE. REPORT TAGGED OR BANDED BIRDS HERE: If you have found a bird (dead or alive) with a tag on its wing or a number on a ring on its leg, you can report it to the Bird Banding Laboratory. They will pass the info on to any other organization that has tagged birds. They will also let you know where and when the bird was originally tagged. (You may have to wait a while before you get a response.) 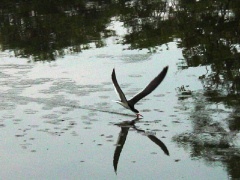 This information is helpful in the study of birds and where they travel. Bird Banding Laboratory, Patuxent Wildlife Center. 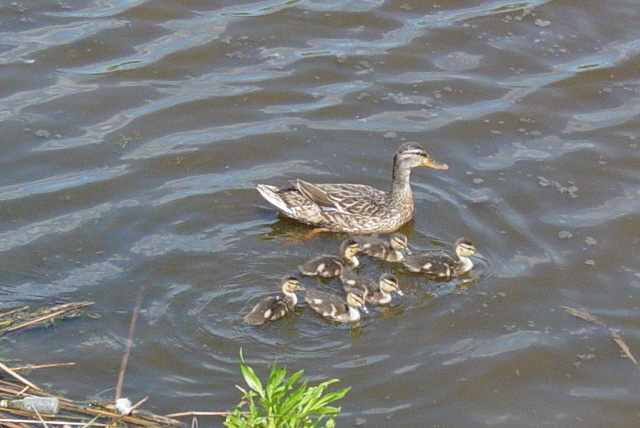 ANIMAL AND BIRD RESCUE: The Bayonne Nature Club is not authorized to do animal or bird rescues. Please click here for information on who to contact if you have an injured animal or bird CLICK HERE. Below: Bobolink singing in field at Newark Bay Waterfront Walkway. May 2016. Video by Mike Ruscigno. 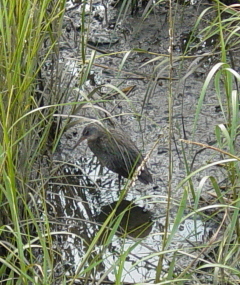 This is not a common bird for this area. Its song is unusual. Some say it sounds like R2D2 of Star Wars. Does it? Photo above: a Snowy Owl was seen on Dec. 24, 2018. We named her Eve in honor of the day. Photo by Patricia Hilliard.